Isaac Brekken/Getty ImagesSpeaking with ESPN, UFC president Dana White strongly implied that former lightweight champion Tony Ferguson would be the next challenger for Khabib Nurmagomedov’s belt. Dana White is already thinking about Khabib Nurmagomedov’s next opponent, and it sounds like Conor McGregor will have to wait for his rematch. Speaking with ESPN, White hinted that he’d like to see former lightweight champion Tony Ferguson get the next shot and Nurmagomedov and his belt. While White didn’t commit to the fight, it’s no surprise that Ferguson is at the top of the list of potential challengers, as it’s a fight UFC has been trying to set up for some time. 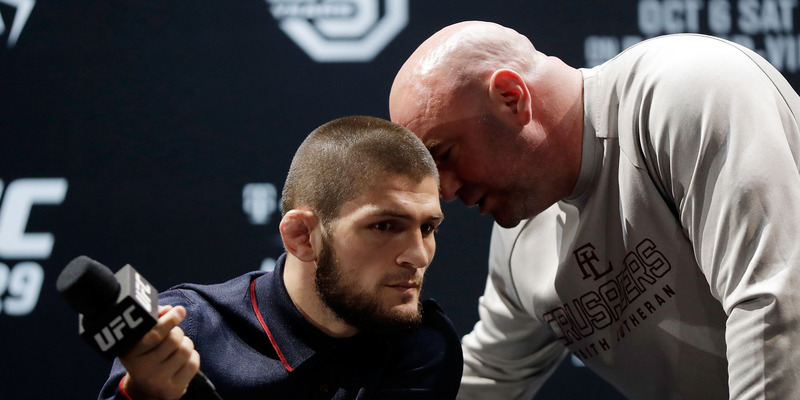 Dana White hinted towards the next opponent of undefeated lightweight champion Khabib Nurmagomedov, and it sounds like those who were hoping for a rematch with Conor McGregor will have to wait a bit. Speaking with ESPN, White was asked – As a fight fan, who he would like to see Nurmagomedov face next? His answer, without hesitation, was the former lightweight champion, Tony Ferguson. While the framing of the question indeed allows White some wiggle room, there’s little doubt that setting up a championship fight between Nurmagomedov and Ferguson is a top priority. While Nurmagomedov-McGregor was the biggest fight at UFC 229, Ferguson’s fight against Anthony Pettis that went off just before the championship was likely a more entertaining contest for most fight fans. Nurmagomedov-Ferguson has been a long time coming. Though it certainly wouldn’t be as big as any fight that features the superstar drawing power of McGregor, it’s a fight that fans have wanted for years and has been scheduled numerous times only to be canceled at the 11th hour due to injuries or weight issues. With Nurmagomedov’s newfound star power within the company, it’s a fight that would bring in eyes. There are no guarantees, and it’s entirely possible that this is just some sort of marketing or negotiating tactic on White’s part to set something up in the future – or possibly a play to draw Nurmagomedov back into the octagon after he’s been heard flirting with the idea of his fight against Floyd Mayweather. Regardless of the reasons, it sure sounds like White wants Nurmagomedov-Ferguson to happen, and with good reason.